I’ve just finished reading Mary Karr’s memoir, Lit, which I loved so much that I just need to effuse or I’m going to throw up or pee on myself or some other unladylike thing (which should in no way be interpreted as a negative response; rather, I am like a small dog when it comes to good books). Bear with me for a moment. Lit was my first foray into Karr’s nonfiction, though I’ve admired her poetry for some time. My therapist recommended Lit to me several months ago — not for therapeutic purposes, just because we both enjoy good literature, and sometimes our sessions have a tendency to turn into a book club of two. Anyway, I’d forgotten all about the recommendation until I came across an article about David Foster Wallace for a class I’m taking, and learned that DFW and Karr had a brief but highly charged love affair involving tattoos and guns (allegedly). The whole thing was very… fraught — and I wanted more. 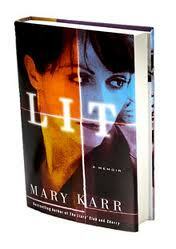 So I checked out Lit after reading a review that suggested Karr would therein dish about this fraughtness. She didn’t. Not really — to her credit, I might add. I went in wanting the juicy gossip, but in hindsight, I can see that it would have been in poor taste. Anyway, what the book was about, was way more interesting. And, there was a surprise conversion to Catholicism at the end. Which I loved. Thank you, Mary Karr. Most of the book is about Karr’s battle with alcoholism and the dissolution of her marriage, which makes for a grim read. I’m not going to review the book because it’s been out for three years and if you want a review you can read this one by Samanth Dunn, which is pretty fair. What I liked about the book is that it seemed to me a fearless act of being one’s self. Karr isn’t worried about whether or not her story is dramatic enough, or if she’s racking up enough sympathy points (or scandal points) in readers’ minds. Like Dunn says, Karr’s transgressions are possibly “tame” when compared to others. But comparison to others isn’t the point, and Karr understands this. She’s Catholic in an age when being Christian isn’t cool, she’s a foul-mouthed when being foul-mouthed isn’t the right way for a Christian woman to behave, and she’s defiantly Southern (a Texan like yours truly, thank-you-very-much) in her northeastern milieu. Frankly, I have a little writer-crush on her. In my final year of my MFA studies, this is what I keep coming back to: the importance of being yourself (or myself). Writing programs are valuable because they expose you to a lot of wonderful literature and theory and people. And mine taught me some really important stuff about writing that I might not have figured out on my own — or maybe it just would have taken me a whole lot longer. But at MFA programs, there’s also a lot of pressure to write like the people who are already famous. And the word “banal” gets overused in workshops. Which can’t be a coincidence, can it? I’ll have to check on this one. Thanks. I’m grateful for the opportunity I was given to learn about different American writing styles. It may not have been the kind of writing I enjoy, but it was a way to open my eyes to a certain way of reading and understanding lit as a writer and not a critic. And I am so glad that thesis time opened the door to the kind of writing I actually want to create. Now, a year away from the MFA, I am much happier with the kind of writer I’d like to be. By the way, I heart Mary Karr, too. P.S. Love your blog and so glad I wandered upon it, friend. Good luck to you on your final year of your MFA. I have no doubt you’re going to create magic with your words. Lit is a great read. I love the way she opened it with a letter to her son. I thought that was so touching and effective.